I'm proud to be one of the few people to have have tracked a stock Nissan Leaf. This is sort of like being proud to be one of the few people who've entered a Pomeranian in a dog fight — at best, people may look at you with disgust. But now I've driven the Leaf NISMO RC, and I know a track-worthy Leaf is possible. 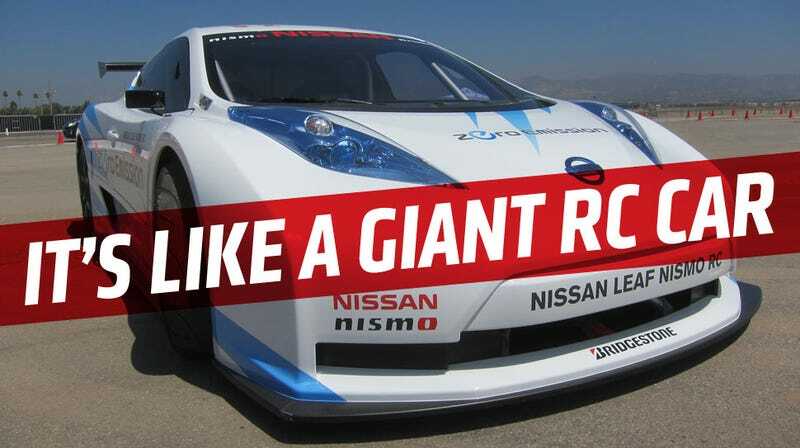 One of the most interesting things suggested by the Leaf race car and all of Nissan's other EV vehicles is the sneaking suspicion that Nissan has exactly one electric drivetrain. There's a bit of tweaking here and there, sure, but if it's made by Nissan and powered by electrons, it makes 107 HP and 207 lb-ft of torque. The 2013 stock Leaf is reduced to 187 lb-ft of torque, but the fundamental motor is the same. This same drivetrain powers Leafs, race Leafs, autonomous cars, delivery vans, and box trucks. All of these were available to try at Nissan 360, where I was last week. Even with the same output as a normal Leaf, the Leaf RC is wildly different to drive, which makes it a great object lesson in how important everything is for a racecar beyond just the powerplant. And there's plenty of difference between this and a regular Leaf. For starters, that same old Leaf powerplant is flipped around so it's driving the rear wheels, like a proper racing car. Incredibly important for a race car with 107 HP, the Leaf has been put on a POW-style diet, slimming down to about 2068 lbs, about 40% lighter than a production Leaf, and that's even while using the same heavy battery pack as the civilian Leaf. You can feel this lightness all over the car. The body feels — and even sort of looks — like the flimsy plastic shells that cover fancy, fast remote control cars. Opening the door isn't that different an experience from opening the door of a Cozy Coupe — the shapes are similar, and they weigh about the same. Inside, it's pure racing car. Roll cage, bare aluminum and carbon fiber, a dash composed of an LCD binnacle and a crapload of toggle switches labelled with a P-Touch. The racing seat is low, with the expected 5-point harness. Everything around you says Real Race Car except for the lack of a burbling engine and the intoxicating smell of exhaust. Really, the only parts of the stock Leaf left other than the drivetrain are the head/tail lights and the badging. It drives like nobody told it it's a Leaf. The steering is incredibly direct and linear, the brakes are rock-solid, and it's stiff and tight in the suspension bits. It's got a one-speed transmission, so I never missed a shift, and being an electric with all the torque available at 0 RPM, the off-the line acceleration is fantastic. It's what I had hoped the stock Leaf would feel like. Still, there's only 107 of those electric horsies, so it tops out right around 90 MPH, and it's like a go-cart or an R/C car in the sense that you drive it to conserve momentum. It understeers for the most part, but I heard from the pro drivers it can snap to oversteer pretty suddenly, and there were times where even I got the heavier, closed-off back end to dance around a bit. The track I was on was a pretty short (0.7 mile) coned-off course, but I did have a hell of a time while it lasted. The Leaf RC is a nimble, frenetic little beast, and when Nissan finally decides to make an up-rated electric drivetrain I think they'll have a pretty potent little track weapon on their hands. Well, that is if they can figure out how to recharge it in the span of a normal pit stop. While on the track, it feels much faster than it actually is, but that's okay. For an interesting experiment — which this clearly is — it's a success, showing that even a modestly-powered electric racecar can be fun and have competitive potential. If I was Nathan Nissan or whoever runs that show, I'd take these NISMO Leaf RCs and stick a second Leaf drivetrain up front to make a 214 hp AWD monster. Sure, the already non-trivial heat issues would get worse, and I'd be reducing the range between charges down from 20-40 miles to something like 10-20 miles, but those few laps before I ran out of juice would probably be incredible. Now if they can get these to shoot showers of sparks on acceleration, we'd really be getting somewhere.